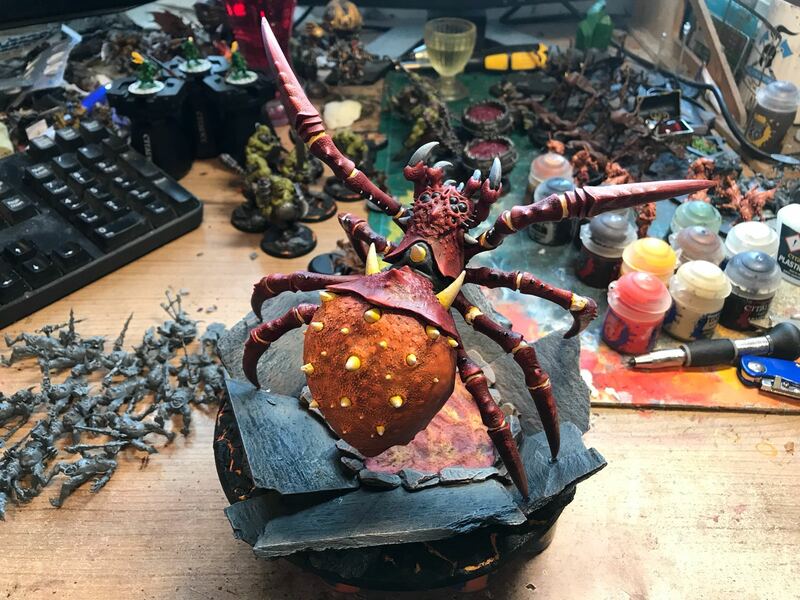 Hobby legend Paul Buckler is making a welcome return to the Blog with an update on his army for our Firestorm Campaign titled From Ember to Inferno and cover how he painted this ace Aracharok! So month 2 saw me tackle my first big spider. I wanted to go with the orange first, as this was the colour that I had envisioned from the start. I started out with the base, making a rocky outcrop for the spider, I wanted him straddling a lava pool, menacing his victims with a 'rearing' posture. 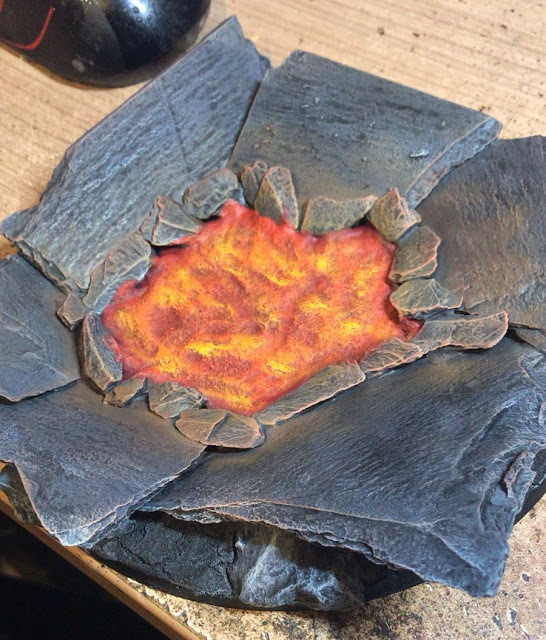 The base is just a standard Games Workshop round, with large pieces of slate and rocks stuck to it. 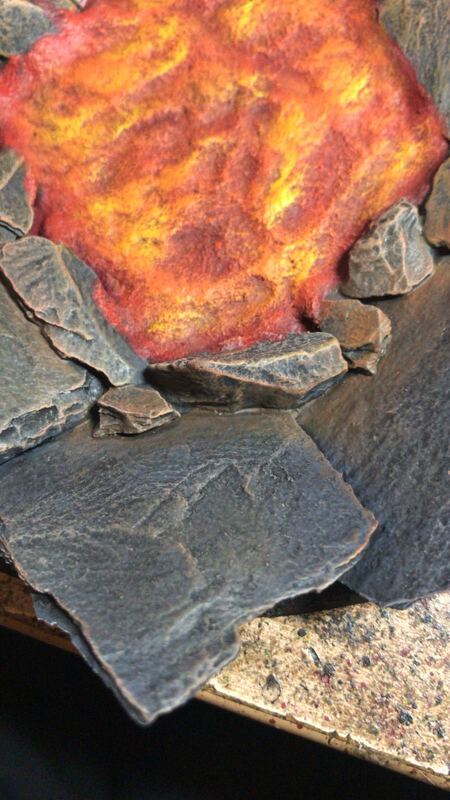 I then add Agrellan badlands to the large open areas, to crack and create lava rifts. The pool was 2 layers of Stirland Mud. I spray the whole thing Chaos Black, then base coated painted the rocks Mechanicus Drey. I followed up with a wash with Nuln Oil then a final drybrush of Terminus Stone. The lava is layers of Khone Red, Evil Suns Scarlett, Trollslayer Orange, Fire Dragon Bright and spots of flash gits yellow. As I made the base before posing the spider, I had to cut and repose several of the legs, it took a while but I am happy with the result. 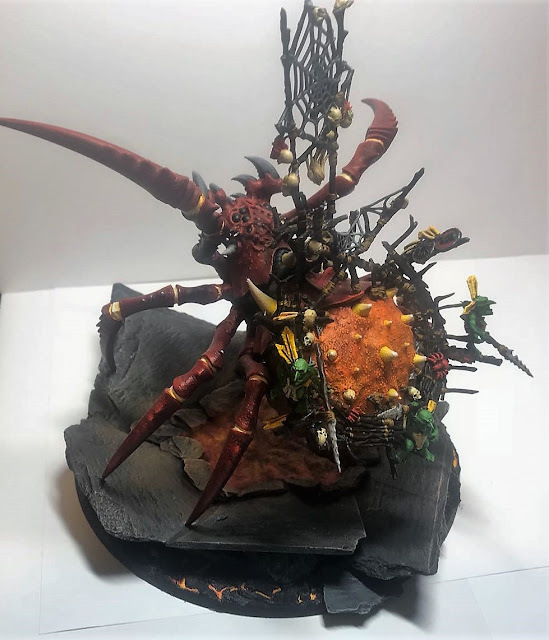 I followed the same scheme for the Arachnarok Spider as for the Grot Spider Riders , trying to match them pretty closely. 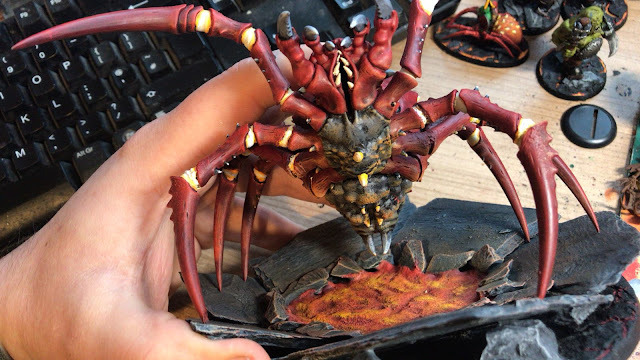 With the Arachnarok being bigger I thought there should be slight variance but nothing too much. 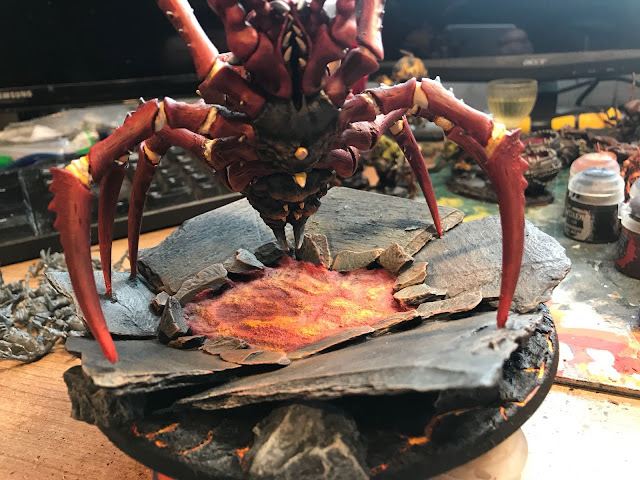 It's Khorne Red, Carroburg Crimson wash, then highlighted up with the red/orange combinations as used on the lava, with a final Wild Rider red top highlight. The spikes were base of Flash Git Yellow, then layered up with Screaming Skull, Pallid Wych Flesh, and Ceramite white. I was really happy with how the spider colours went, but the howdah was a real pain. It's very fiddly and much trickier to do. It's the weakest point of the model, but still looks acceptable. 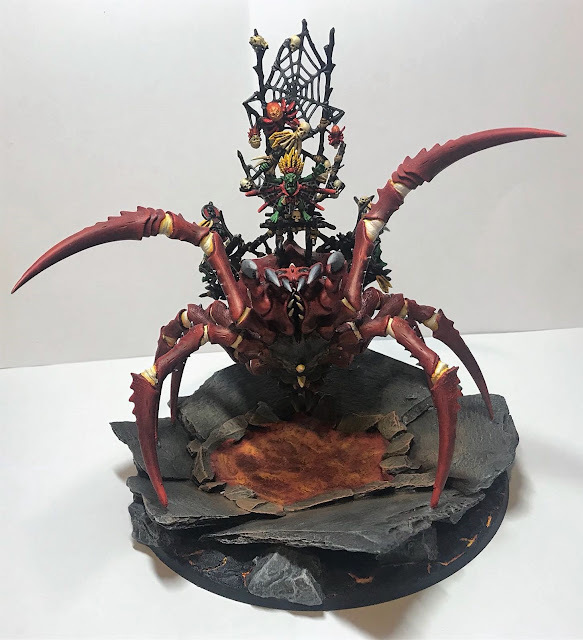 I opted to not put all the crew on, just the spears, as I wanted the bows potentially for a unit of archers later, and also it looked very cluttered with them all on the spider. 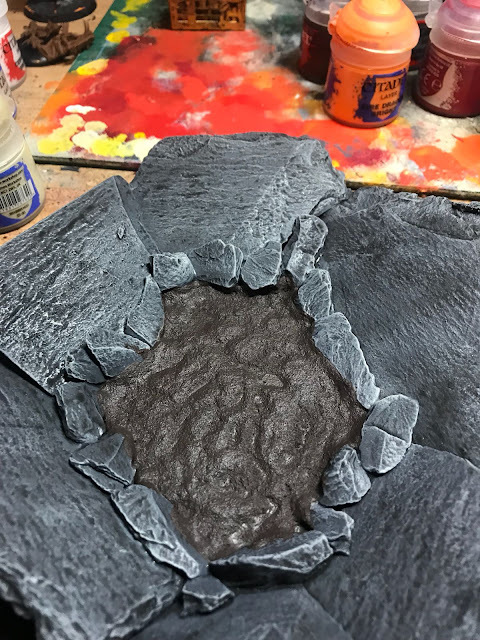 Right at the end, someone, I think maybe Aaron, (apologise if it was Chris or Matt), suggested some OSL (Object Source Lighting) from the lava pool. Never having tried it before I was slightly hesitant, as the spider was looking good and I didn't want to ruin it and have to start again. But this project was all about pushing my hobby, so I went for it. Overall I think that came out well, and improves the model. I was especially happy with the shadows I added to the rocks from the legs, using multiple coats of Nuln Oil. The crew needed very little in the way of repositioning, the howdah had plenty of spots to stand them on, even in the new pose. The green contrasts well and sets off the red quite nicely. Next month another spider, this time a green beast.